As an avid retro sports gamer, I’m always picking up old sports games that I either don’t have or have never played. Doubly-so when they’re Ice Hockey, Golf, or Baseball games. Sometimes I find a hidden (at least to me) gem, and sometimes that dollar would have been better spent if flushed down the toilet. 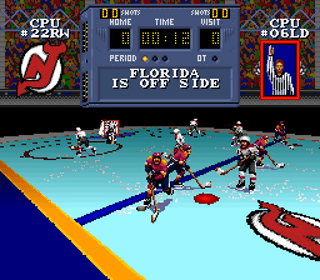 NHL Stanley Cup attempts to use the Super Nintendo’s “Mode 7” effect to create a pseudo-3D hockey game. Unfortunately, the result is a vomit-inducing bumper car ride that only vaguely resembles hockey. The camera remains locked on the puck, pivoting left and right based on the puck’s position on the ice in such a way that causes the camera to be in a constant state of motion. I was only able to play this game for about 10 minutes at a time because apparently that’s how long it takes for motion sickness to set in. If that wasn’t bad enough, the game’s unresponsive controls and constantly shifting perspective make it impossible to play with any degree of competence. The game does have an NHL license, but no NHLPA license so players are referred to by number only. Game modes include a single game exhibition, a full season, and a best-of-7 series. The only game customization options are the ability to turn penalties and line changes on and off and adjust the length of periods. Released 8 months after the superlative “NHL ’94” it was an instantly outdated title (although it would have been equally horrible were it a SNES launch title.) NHL Stanley Cup is easily the worst hockey game I have ever played, and one of the worst games of any genre. If you run across this game and for some reason feel the need to purchase it, do yourself a favor and grab a bottle of dramamine at the same time. Buy NHL Stanley Cup on GameGavel or Amazon. Tagged Hockey, Mode 7, NHL, NHL Stanley Cup, Review, SNES, Sports, Super Nintendo. Bookmark the permalink.